Da Vinci Diamonds is a brilliant online video slot machine game from IGT (International Game Technology) that was released in June 2008. This video slot game has 5 reels and 20 pay lines. The theme of Da Vinci Diamonds, as its title implies, is inspired by the life, philosophy, art and masterpieces of the famous Italian artist Leonardo da Vinci. Most people knew Da Vinci to be a great artist and architect, and he was renowned for his inventions and one very famous painting (The Mona Lisa). What most of us do not know is that the man had a certain fondness for precious items of great value. Thus, the Da Vinci Diamonds was created by IGT, a simple yet straight-to-the-point slots game that will surely interest you to play and stay a while! Slightly different from usual slot games, when you “spin” the reels on the Da Vinci Diamonds slot game, instead of spinning, the icons tend to fall or tumble down. Whenever you hit a win, the icons involved in that win will be eliminated, and the space that is left by them gets filled up with more new icons that seem to fall down from the sky, courtesy of the game’s Tumbling Reels™ Feature. This means that you can get multiple wins in just a single spin! Most people love playing this slot game because not only can they get multiple winning combinations in one spin, but they can also activate the Free Spin Bonus Feature game without much effort! The concept is so cleverly implemented that it is worth seeing for yourself! Another thing that slot players really love about IGT online slot games is that they can play the game instantly, and they are not required to download anything! No matter which gem or painting you like most (rubies, emeralds, diamonds, The Mona Lisa, etc), you will certainly love all of them when you play Da Vinci Diamonds as you get to experience an excellent and rather unique slot game wherein the maximum coin jackpot is 25,000, the maximum cash jackpot is $25,000, it has scatter wins, wild symbols, a Tumbling Reels™ Feature in both the main game and the Free Spin bonus game, you can win up to a whopping 300 Free Spins in the Free Spin Bonus Feature game, and last but not least, it has a theoretical average return to player (RTP) of 94.94%! The Da Vinci Diamonds is considered to be a very excellent online slots game of IGT because it utilizes what is called the Tumbling Reels™ Feature. Even if this feature is used by other slots games (just under a different name), what’s unique about the Da Vinci Diamonds is that the Tumbling Reels Feature not only is active during the main game, but it is also active during the Free Spin bonus game! In the game, the background of the reels is of a minimalist style, colorful symbols are laid out on a black backdrop, which actually does not strain the eyes. The symbols are drawn beautifully and you will surely become mesmerized by the sparkly gems as they tumble down the reels. 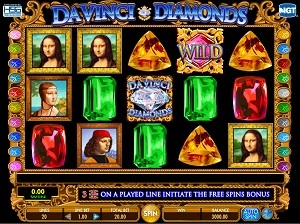 The overall graphic design of Da Vinci Diamonds displays a wide array of colors such as green, blue, pink, red, orange, white, gray, purple, yellow, and of course, gold. As for the sound, Da Vinci Diamonds rather a quiet one, maybe it’s the fact that when Da Vinci paints a masterpiece, complete silence must be thoroughly observed. However, when you spin the reels, you will hear something like beads falling as the symbols tumble down; and whenever you hit a win, you will hear sparkling and tinkling sounds as you see your wins are added up to your total! When you are in the Free Spin Bonus Feature game, lively and fast-paced music made from a violin will be heard as the Free Spins are being used up. In the Da Vinci Diamonds slot game, there are no card deck symbols available here. Instead, the symbols that you will see here are gems such as the Da Vinci Diamonds, the red Ruby, the green Jade, the Amber Gem; and paintings of Mona Lisa, Lady with an Ermine, and Leonardo da Vinci himself. The Wild Symbol is the Gem symbol. The Gem wild symbol acts as a substitute for all other symbols (except for the Priceless Fine Art scatter symbols and the Bonus symbol) in order to help you complete winning combinations. When you are able to get winning combinations with multiple Gem wild symbols on an active pay line, you will be given varying prizes (refer to the Paytable). If you manage to get 5 Gem wild symbols on any active pay line, with the maximum bet, you will be awarded the top prize of 25,000 credits per line bet! There are actually 3 Scatter Symbols in the Da Vinci Diamonds slot game, and they are known as the Priceless Fine Art symbols. These scatter symbols are not required to come out in a line on an active pay line for you to win. The Priceless Fine Art scatter symbols can be found anywhere on the 5 reels, and you will be able to complete winning combinations as long as 3 or more of these scatter symbols come out in a single spin. Your winnings are calculated via multiplying the scatter symbols combination payout (refer to the Paytable), by the total number of coins you’ve bet. Please take note that if obtain a scatter win and a regular win, you will be paid out for both of these wins, because the scatter symbols are not required to appear on an active pay line for you to win. The scatter awards are entirely independent from pay line awards, and so they are included to the total amount paid. • Da Vinci Diamonds Free Spin Bonus Feature Game – The Free Spin Bonus Feature game can be activated if you get 3 or more Bonus symbols to come out on an active pay line. The Free Spin Bonus Feature game can only be activated once on a given play of the reels. The Free Spin Bonus Feature game will begin with 6 Free Spins. The Free Spins are automatically played out. In the Free Spin Bonus Feature game, there are 5 Bonus symbols that you will see – the Pearl, the Teardrop Gem, the Sapphire, the Yellow Gem, and the Da Vinci Double Diamonds. During the Free Spin Bonus Feature game, you can re-activate the Bonus symbol many times. The Free Spin Bonus Feature game will continue until there are no more spins remaining, or until the maximum amount of 300 Free Spins have been played. To re-activate the Free Spin Bonus Feature game, you must get 3, 4, or 5 Bonus symbols anywhere while playing the Free Spin Bonus Feature game. If you get 3 Bonus symbols, you are given extra 2, 3, or 4 Free Spins. If you get 4 Bonus symbols, you are given extra 4, 6, 8, or 10 Free Spins. If you get 5 Bonus symbols, you are given extra 6, 8, 10, 12, or 15 Free Spins! Please take note that during the Free Spin Bonus Feature game, all of the 10 pay lines are enabled. Your bet per line in the Bonus is the same as that of the bet per line on the reel spin that activated the Free Spin Bonus Feature game. To make things more exciting, in the Free Spin Bonus Feature game, there are many more ways to win! In addition to getting paid on the lines, many of the symbols pay as Scatter pays as well! You only have to get 3 or more of the same symbol anywhere on the reels to win Scatter pays! When the Free Spin Bonus Feature game is over, you will be taken back to the main Da Vinci Diamonds online slot game, and your winnings from the Free Spin games will be included to your overall balance. • Da Vinci Diamonds is well-liked by many online slots players because of its unique Tumbling Reels™ Feature that is active during both the main slot game and the Free Spin Bonus Feature game. All of the winning combinations are calculated, and the values are included to the credit meter. All symbols involved in the winning combinations will disappear, and then new symbols will tumble from above, in sequence, filling in all the empty spaces. The Tumbling Reels™ Feature will stay active until there are no more winning combinations made from the Tumbling Reels™ Feature. Da Vinci Diamonds has 5 reels where you may bet on 20 pay lines. The minimum bet is 0.01 and the maximum bet is up to 5.00. You may wager from 1 up to 5 coins per pay line.